Secret recipe club time! For those who are new, each member of SRC is secretly assigned a blog each month to peruse and choose a recipe to post. All is revealed on the same day and today is Group D's turn! This month I was assigned I am a Honey Bee by Nicole. I had a brilliant time on Nicole's blog and found even though we live on opposite sides of the world we actually have a lot in common (apart from just a love of food and cooking) - we are both detail oriented, hate the cold, are morning people, think eggs Benedict is the best way to eat eggs and love Buffy the Vampire Slayer (I binge-watched the entire series again when Oscar was a baby and I was stuck on the couch feeding). I also found similar food journeys and she has completed not one but two rounds of the Whole30. I eat pretty cleanly (no sugar or dairy and reduced grain) most of the time and am really keen to give it a go. I have bookmarked a few of Nicole's Whole30 posts to re-read when I do finally take the plunge. 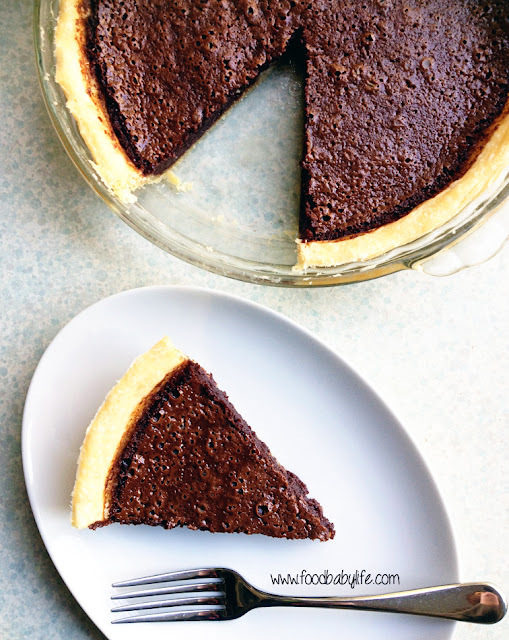 In the end I couldn't go past the Chocolate Chess Pie because I have seen the name around for years and wondered what on earth it had to do with chess! After a bit of research I am none the wiser (there seem to be at least 3 distinct explanations) but I am delighted to have made this delicious chocolate pie. I love that this one has cocoa powder rather than chocolate which makes it cheaper and easier to whip up. I did make a few substitutions like using coconut oil instead of shortening in the pastry and some rice malt syrup instead of just sugar in the filling. The taste test? It was completely delicious. The top was crispy and crackly while underneath was creamy, chocolatey and sweet without being too rich. The pastry was light and flaky and I loved the slight hint of coconut with the chocolate. The pastry was a little underdone in the middle although the filling was perfect so next time I would blind bake the pastry first to make it extra crisp. Grease a 9 inch pie dish and set aside. Keep the butter and coconut oil in the fridge until ready to use. Place the flour and salt in a food processor fitted with the dough blade and pulse a few times to combine. Add the coconut oil and butter and pulse until the mixture is crumbly. Gradually add enough ice water to the mixture while pulsing until a ball of dough is about formed. Tip the dough onto a lightly floured surface. Press into a disc then wrap in plastic and place in the fridge for 20 minutes. Once chilled place the dough back on a floured surface and roll out to approx 3mm thick. Add more flour if it starts to stick to the bench while you’re rolling. Press onto the base and sides of the prepared pie dish and trim and crimp the edges as needed. Cover the pie plate with plastic wrap and place in the refrigerator for at least 30 minutes to overnight. Using a stand mixer or large bowl with electric beaters, beat together the cacao, sugar, coffee powder, melted butter and syrup and beat on high speed. Add the vanilla extract and eggs and mix on high for approximately 2-3 minutes. Pour the mixture into the unbaked pie shell and bake for 35-40 minutes. The centre of the pie will still be a little soft but it will firm up as it cools. Leave on a wire rack for at least an hour before slicing. I baked mine the day before and stored in the fridge then left at room temperature for 1 hour before serving. Thanks Nicole for a great recipe and great month! While I'm more of a Julia kind of person, everything in moderation, this looks delicious!!! I love chess pie, but have never tried a chocolate version. This one sounds so good. Happy reveal day! I've never tried the others but this chocolate one was AMAZING! Great pick and looks delicious! 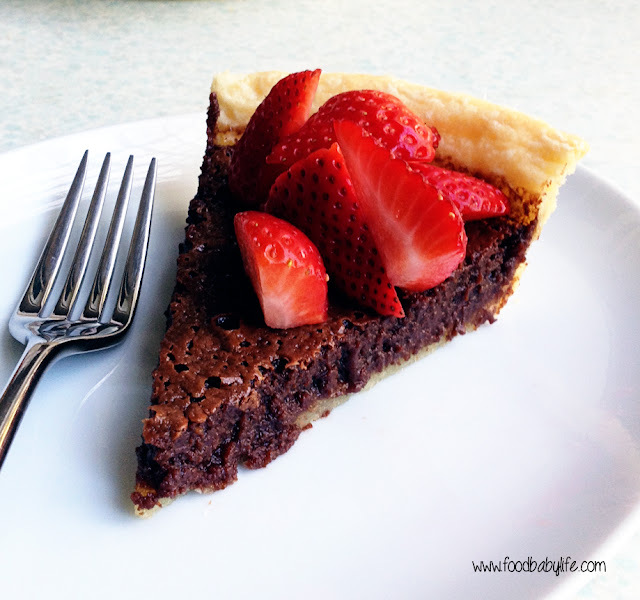 I have never heard of chocolate chess pie (or any kind of chess pie, actually), but I sure would love a slice of that. Looks fabulous. It seems to be a Southern specialty but I've seen versions popping up all over the place. Definitely worth a try! Oh I love chocolate and I love pie and I love the changes you made - perfect pick this month! I have never heard of a chess pie. I will have to give this a try. OH my goodness that looks pure decadence Susan! LOVE it and I too have always wondered why it was called chess pie too! There seem to be many and varied explanations but no matter, it's delicious!! I really need to try out Cheese Pie! This chocolate version is right up my alley! Happy Reveal Day! You should definitely try it, it was fabulous!! If I remember correctly, I am a Honey Bee was one of my first assignments with the club... loved it! you picked a perfect recipe, one can never go wrong with chocolate! Yep it was really hard to pick this month but this recipe was a winner! We loved this one, give it a try! I'm so glad you tried this pie. I looks heavenly. I need to make it again very soon!! I watched so much buffy while on maternity leave to. I have the complete set. The best!!!!! And of course, I had to start watching Bones because of Angel... I mean David!... I'm hooked on that too. ha! YUMM!! That looks absolutely DIVINE! Fantastic pick to share today! Seriously though, this is a pie I could get behind (fruit pies just aren't my thing)! You should totally try this one! I'm a sucker for a good chess pie, but a chocolate one? Amazing! Delicious choice this month. This one was awesome so I think I need to try the original too! looks good! maybe it's called chess pie because it's black and white like a chess board? I love chess pie so much, particularly lemon chess pie. This one looks great and I hope I get to try it in the near future. I love chess pie! I have never had a chocolate version though. Great pick! Thanks Erin, it was delicious!! Yum! I have never had chess pie before. This version looks delicious! Great pick!